What Is a Legal Will in the State of North Carolina? Wills in North Carolina can take many forms, depending on the circumstances. However, for each form of will to be declared valid by a North Carolina probate court, the will must conform to the requirements of the North Carolina state code Chapter 31 for the type of will being used. Attested wills are what most people would consider a “standard” will. They are written by the testator, the legal term for a person writing a will, and signed before two competent witnesses who must also sign the will. They are often typed or word-processed for clarity, but a handwritten will is also acceptable in North Carolina. The testator must be 18 or more and of sound mind for an attested will to be legal. A holographic will is a will that is handwritten by the testator. A holographic will does not require witnesses, and any writing on the will by another person will not affect its validity providing the meaning of any part of the will is not affected. North Carolina allows holographic wills written in the hand of another, provided the testator wrote her name in her own handwriting in or on the will, and also signed it. Nuncupative wills are oral wills made by a person who, according to the North Carolina state code section 31-3.5, suffers a “last sickness” from which he does not survive, or he is in immediate danger of dying from some other cause. The testator must make the will before two competent witnesses whom he has asked to bear witness. For a will requiring witnesses to be legal in North Carolina, the witnesses must be regarded as competent under state law. The North Carolina state code does not define what “competent” means, however. Furthermore, section 31-10 of the state code provides that a witness may be a beneficiary to the will only where there are at least two other disinterested witnesses can attest to the validity of the will. Your will can direct the distribution of your property after your death, name someone you trust to manage your estate and even nominate a guardian for your minor children. But your will can't do any of that if it isn't valid in your state. Generally, a handwritten will is just as legally valid as a typed or printed will as long as it meets your state's standards. Is a Written Will a Legal Document? A will is a legal document because it grants rights to the will's executor and beneficiaries. However, a will is only a legally valid instrument if it meets criteria as defined by state law. A will that fails to adhere to such criteria may be deemed worthless in a state court. Therefore, when preparing your will, it is essential to familiarize yourself with the laws of your state or have an experienced attorney draft the document. Your will explains to those you leave behind how you want them to deal with your property when you die. It also allows you to appoint someone you trust to handle your estate, as well as to appoint a guardian for your minor children. Although there is no set form for wills across all states, a few basic rules can make a will valid in the eyes of a probate court. 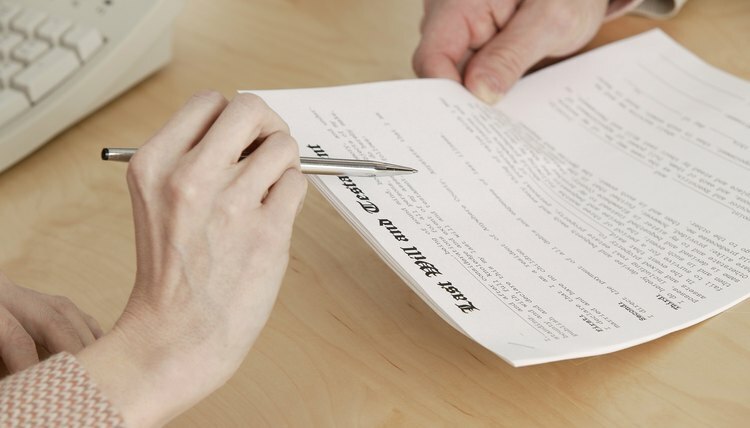 Can a Person Write Their Own Will & Then Have It Notarized? Can You Contest a Will When the Testator Was Medicated?